Dr. Gupta Helps Patients at Ganga Hospital in India | Munish C. Gupta, M.D. Dr. Munish Gupta visited Coimbatore, India, to operate on patients with severe scoliosis and to teach in a Scoliosis Research Society operative course at the Ganga Hospital. The course involved 25 surgeries demonstrated by 9 internationally renowned spinal surgeons, which attendees could observe, as well as lecture sessions on patient evaluation, technique and tips, and avoiding complications. The Ganga Operative Spine Course is held once in two years and is globally popular for its specific focus on live demonstration of spine surgeries, ranging from the simple to the most complex. Experts in the field share their wealth of experience and practical skills with the delegates, taking them through the various steps of surgery in detail. The Course thus offers the unique possibility for the delegates to not only witness the surgical procedures live but also to interact with the experts and to ask questions. 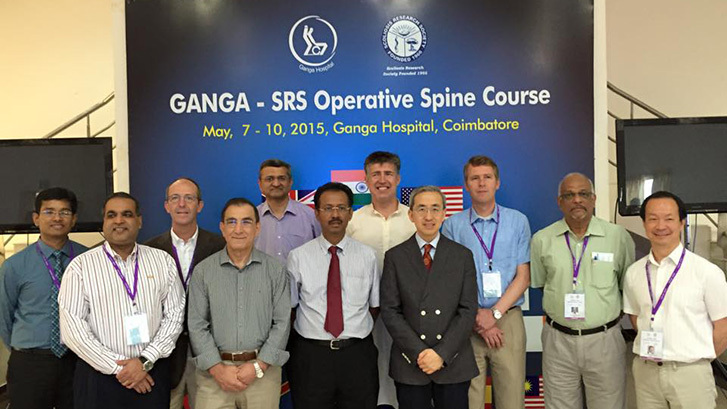 The 6th Ganga Operative Spine Course from May 7-10, 2015 is unique in that we are joining hands with the Scoliosis Research Society with many of their eminent members participating. They will be joined by many eminent faculty from the Association of Spine Surgeons of India.